The House of Representatives yesterday moved to set up a high powered Ad Hoc Committee to carry out holistic and comprehensive investigation on the illegal deployment, uses, misuses, and abuses of Nigerian Army during 2019 general elections. Moving the motion, Patrick disclosed that the Nigerian Army is been dragged into partisan politics on purely civilian contests that can damage it’s professionalism, it’s national acceptability, ethical standards, discipline and rating both national and international. He said, “the 1999 Constitution as amended is the Supreme Law of the Land and all actions of governments, government agencies and individuals, including the Army must be in full compliance with the 1999 Constitution as amended as the Nigerian Amied Forces is a creation of the Nigerian Constitution ; Section 271(1) “The Armed Forces Act, which is the law guiding our armed forces, derives from the 1999 constitution and also made express provisions for the structure, management and operations of the Armed forces of the Federal Republic of Nigeria. “The Nigerian Constitution not only created the Nigerian Armed Forces hut prescribed that the armed forces can only be deployed in civilian operations in accordance with Section 217(2) (c) viz; . Abdul Abold sitting in Abuja on 15th February, 2015, in upholding the judgment of the Ekiti State Gubernatorial Election Tribunal of Ayodele Fayose made a defmite pronouncement that *the Military has no role to play in the e1ectoralprocess and that whoever deploys the military for the conduct of elections has breached the Law “The Federal High Court Lagos, wherein Jusctice Ibrahim Buba, in a case instituted, incidentally by the present Leader of the House, Rt. Hon. Femi Gbajabiamila, on 231d March, 2015 declared as *unlawful the deployment of Soldiers for any election in the country without recourse to the National Assembly “The House is eonvhnced that the National Assembly had at no time been consulted for or approved any instrument whatsoever With respect to the deployment of the Soldiers of the Nigerian Anny for the 2019 general elections or for any elections for that matter. “Disturbed that despite these express provisions of the laws of the land and the unambiguous judgments of the different Courts of the Land, The Chief of Army Staff , was reported by ThisDay Newspaper of 21st January, 2019 as not only stating that the *army cannot disobey any Order given by the President* on the shoot to kill ballot box snatchers controversy , but had also in the same statement directed Commanders and Soldiers on how to operate during elections, without any recourse to the relevant laws of the land or the National Assembly. 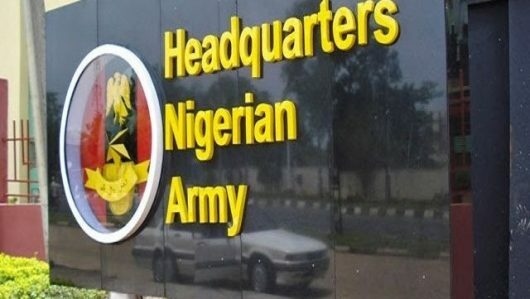 “Further disturbed that despite strident opposition to this position of the Chief of Army Staff on the deployment and possible role of the Army during elections, the Nigerian army allegedly deployed its officers and men in large numbers during the 2019 general elections in flagrant disobedience to the courts and our laws, without any communication to the National Assembly. “Further worried at the ongoing claims and counter claims that some of these men in army uniforrfi were either real soldiers of the Nigerian Army or fake soldiers in Army uniforms, but who were riever arrested by the Nigerian Police or the soldiers on duty throughout. “Concerned that such a nationally accepted, unifying and critical agency like the Nigerian Army is unnecessarily being dragged into partisan politics on purely civilian contests that can damage its professionalism, its national acceptabihty, ethical standards, discipline and eating both nationally and internationally. “Concerned that the Chief of Army Staff is also reported to have set up a panel to investigate role of soldiers of the Nigerian Army in the Rivers State Gubernatorial and House of Assembly electlons of 9th March, 2019, when the amiy should NEVER have deployed any of its Soldiers in the first place and in a move that is akin to a man sitting in Judgment over his own case.